George died 1849. Mahala Mills also took over the license of the Brunswick Wine Vaults/Hotel. ORNITHOLOGICAL.—About four o’clock on the afternoon of Monday last, the 10th instant, as Mrs. Mills’ stage coach, between this town and New Norfolk, was returning to Hobart from that district, and nearing Bridgewater, the singular appearance of a very numerous flock of water-ducks elicited much surprise and speculation. One passenger was heard to remark that he had only observed such large number once before, and that was at Port Fairy. Some amusing conversation ensued, as to the most certain method of capturing these fowl, and one person, endowed with the shrewdness of Sam Weller, facetiously suggested the plan of diving below the surface, and catching hold of the birds by their legs, as they sat or rode upon the undulating bosom of the water! THE NEW NORFOLK RACES.–Mrs. 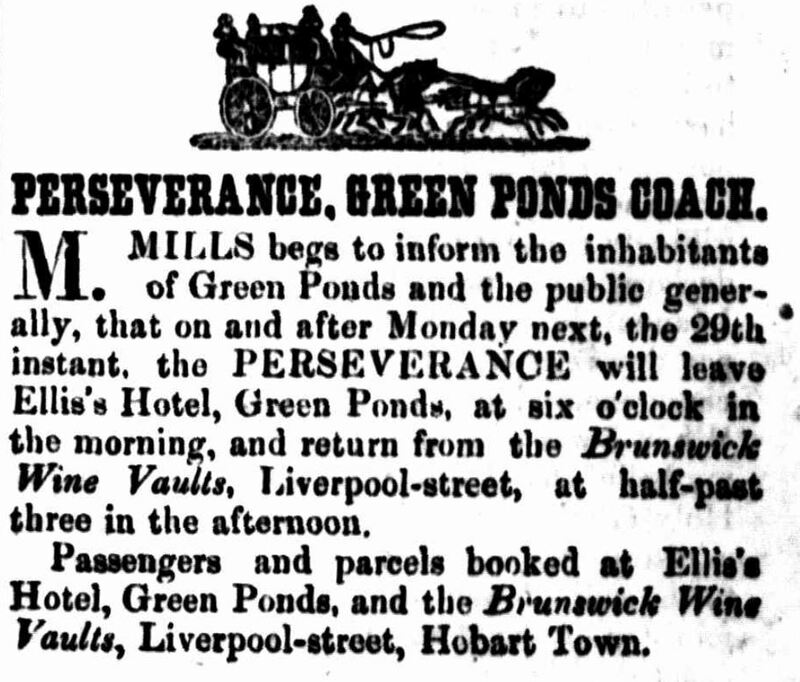 Mills has put on an extra coach for this day, so that the early readers of this newspaper are in time for her conveyance. Swordsman was freely on Tuesday against the field, but we hope if his owner has the least doubt of this condition, he will not risk the high character he has already won. Thomas Conskarden, was charged by constable Ridge, with misconduct in idling about Liverpool-street yesterday, and divers days before that. The defendant said he had been working for Mrs. Mahala Mills, the coach proprietress. Bench—Have you any thing to say in your defence. Prisoner—(innocently), What’s that? Bench—I ask yon if you’ve got any thing to say for yourself. Prisoner—Oh! I understand! No, I’ve not. Bench—Then I sentence you to hard labor, with imprisonment, for two months. Prisoner (retiring)— Thank you, sir. DETENTION OF THE LAUNCESTON MAILS.—The mails from Launceston did not arrive here until 11 o’clock yesterday morning. The delay was caused by the horses that were in Mr. Page’s coach bolting at Lovely Banks, near Spring Hill, and breaking down the coach to pieces. We are glad to find that none of the passengers were injured, although they all had a narrow escape. 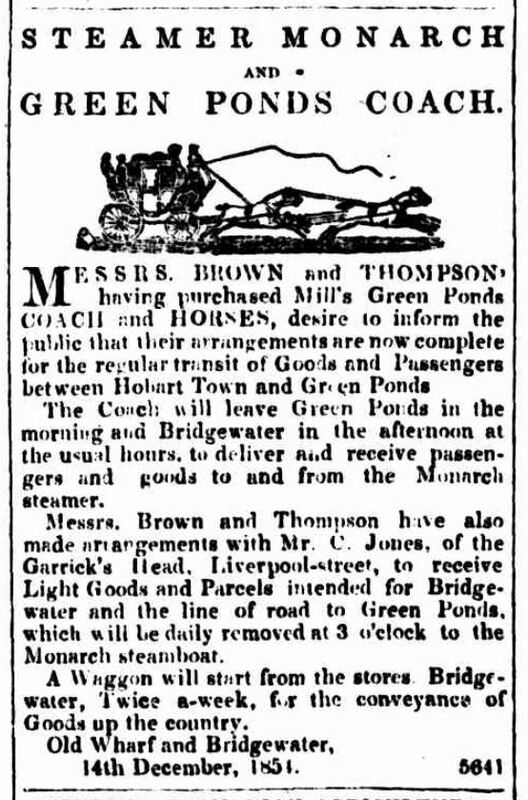 The mails were conveyed hither by Mrs. Mills’ Green Ponds coach. A man was accidentally killed on the New Town Road on Monday last, by the New Norfolk coach belonging to Mrs. Mills passing over him. It appears the horses started whilst he was putting a trace to right, and that not the least blame can be attached to any one. NARROW ESCAPE.-As Mrs. Mill’s coach was last evening turning the corner between Liverpool and Elizabeth-streets it came in contact with Mr. Drink water’s gig, but no damage fortunately was sustained on either side. 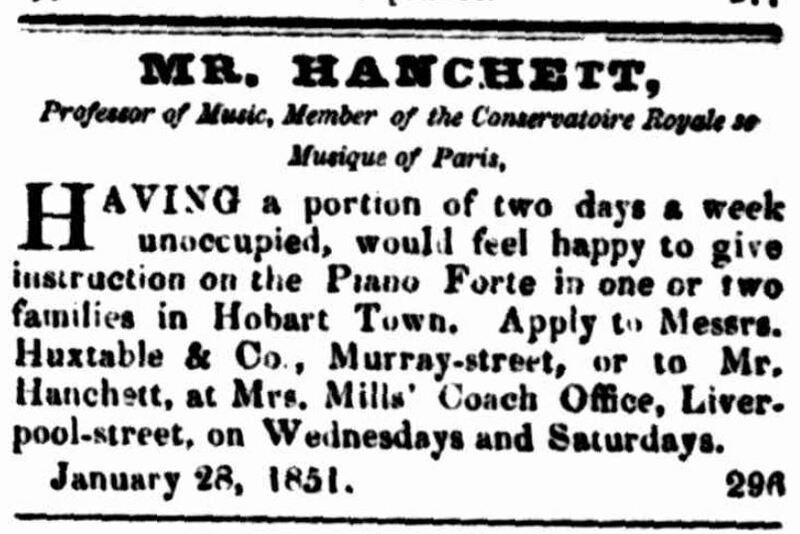 In the afternoon, however, the guard of Mrs. Mill’s Coach (having found means to cross the creek) arrived at New Norfolk, bringing with him the Mail, and also the welcome intelligence that the coach was waiting at the other side the creek, for any passengers who might wish to go to Hobart Town. 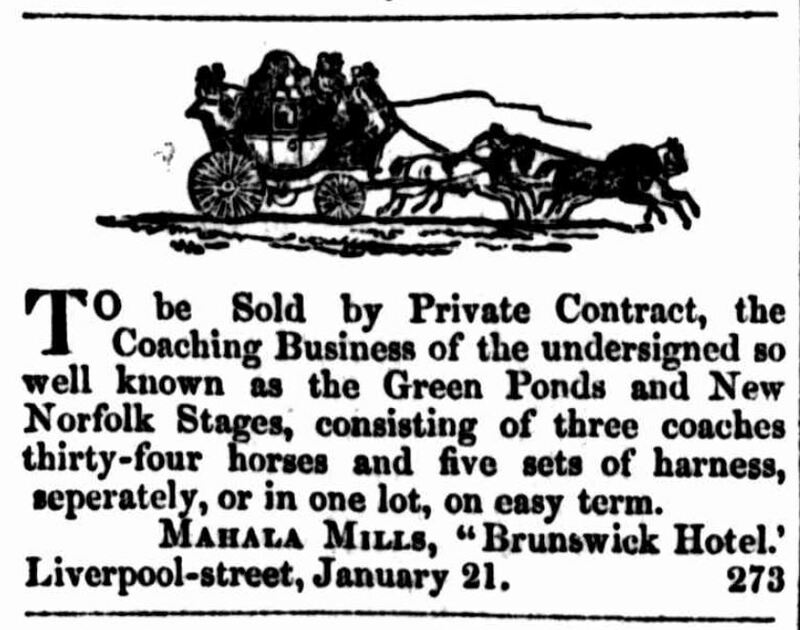 The spirited proprietor of the New Norfolk Coach, Mr. Hagon, immediately started with a conveyance and six passengers for the Creek, and after conveying them on horseback across a portion of the road which was flooded, succeeded in transporting them by means of a boat safely on the other side.